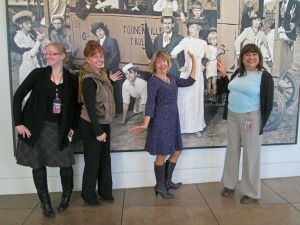 The New Mexico History Museum recently welcomed four new folks to the administrative team. As seen in the photo, they are, from left, Hannah Abelbeck, who works in the Photo Archives, digitizing and archiving images; Rita Garcia, who oversees front desk staff; Arlene Ann, who takes over Carla Ortiz’s administrator role; and Arcelia Pineda, who is is our go-to person for all things financial. Wander into the Palace of the Governors’ entrance and you’ll get a taste of the renovations being planned for our favorite National Historic Landmark. The front desk has been converted into a smaller, more appropriate size, clad in copper and topped with granite. On the walls, you’ll see a contemporary take on New Mexico’s Hispanic culture. A few of Jack Parsons’ images of Northern New Mexico lowriders make up a temporary exhibition that also celebrates the Photo Legacy Project. 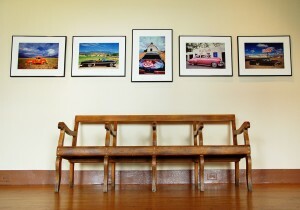 As dreamed up by the Palace of the Governors Photo Archives, the project collects the works of contemporary photographers. Parsons was an early and eager contributor. The photos on display first appeared in the 2005 Museum of New Mexico Press book, Low ’n Slow: Lowriding in New Mexico, by Parsons, Carmella Padilla and Juan Estevan Arellano. Through Parsons’ images, Padilla’s essays and Arellano’s slang-style dialogues, the book explored the lowrider lifestyle in ways that honored its dignity. Parsons, who lives in Santa Fe, won a 2006 Governor’s Award for Excellence and Achievement in the Arts. His work can be seen in numerous books, including Dark Beauty and Santa Fe Style. 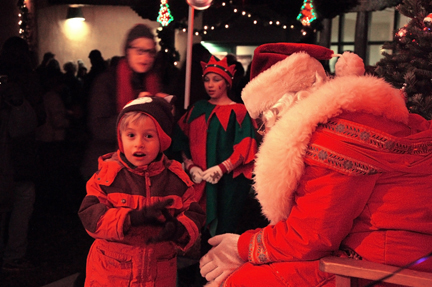 The weekend of December 13, 2013, saw the 29th annual version of our two most popular events, Christmas at the Palace, on Friday evening, and Las Posadas, on Sunday. More than 1,500 people turned out for each event, some eager for some quality time with Santa, som e looking to help recreate Mary and Joseph’s search for an inn. The Palace Press let folks work one of the antique presses. Local groups provided live music, hot cider and cookies were abundant, and we even pulled out some kids’ crafts and a few pinatas.